Universal Winding Transformers - Agile Magnetics, Inc.
Agile Magnetics has been designing and manufacturing premium quality transformers since our inception in 1992. Our tradition of quality focuses on our ability to develop custom transformers that operate at the highest levels of quality and performance, including Universal Winding units. These transformers are specially designed for numerous applications, including those requiring extra isolation and high voltage. 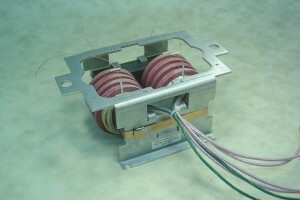 Universal Winding Transformers are designed with an increased build of the coil to provide space between the turns. This added space provides a number of distinct advantages; most importantly, it excels in accommodating high voltage windings. It also offers additional isolation by allowing dielectric oil to pass through freely into the coil; this coil reduces the capacitance of the winding, as well as the occurrence of arcing and corona. Our team of professionals provides expert consultation to help customers to determine if Universal Winding Transformers are the most appropriate choice for their individual application. We pride ourselves on offering ISO-compliant services that meet the industry’s toughest standards of quality. Prior to delivery, our technicians computer test 100% of the transformers we manufacture. For further information or to get a quote, please contact us today.